This is an interesting example, not only because of the rare image of Saint Roch, who protected against the plague, and the accompanying prayer, but also because of the typology of the Coffer, which is distinctive from others in the group and includes tooled leather covered with fittings and no extra compartment. Approximately 140 Gothic Coffers and fugitive prints survive (110 Coffers and 30 prints), most in European museums. The eleven examples here, many previously unknown, are all French from around 1490 to 1510. A few preserve their secret compartments or their horsehair cushions, evidence that they once contained relics and were carried as backpacks. All include rare hand-colored prints, some unique, others surviving in only a few impressions. Most of the prints are related to the Parisian workshop of the Master of the Très Petites Heures of Anne de Bretagne. Any study of the origins of French print-making must take into account these Coffers and their remarkable prints. The body of material is exceptional, for the viewing context helps explain the function of the prints. A sale in 2007 of twenty-two Gothic Coffers - the largest single collection formed by André and Marie-Thérèse Jammes - prompted renewed interest in these art works and resulted in a flurry of new studies. Significant among these are investigations by Severine Lepape and Michel Huynh on the typology of the coffers, the identity and attribution of the prints (including a yet-unpublished census), and the union of print and coffer. 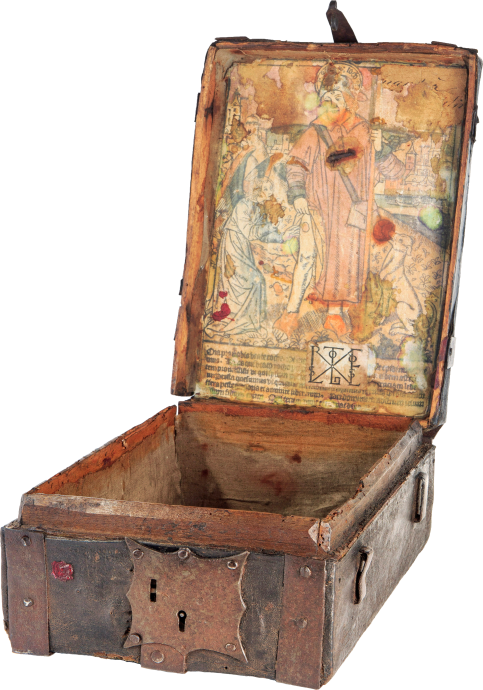 The recent discovery of a Northern Renaissance painting of the Rest on the Flight, published by Sandra Hindman, prompts a reconsideration of the Coffers with prints as traveling boxes. Painted in Antwerp c. 1530 by an artist working in the tradition of Joachim Patinir, the painting includes a detail of a large, partially opened box. A small leather-bound book with clasps, a rosary composed of precious gems, a brush, scissors, and two finger-rings all nest on a bunch of diaphanous white cloth inside the box. This detail survives as the only known contemporary depiction of these Gothic Coffers. The painting thus encourages us to revisit the question of the purpose of these traveling boxes - symbols of "the house and the garden of the Virgin." The painting helps clarify the interactive viewing context of the Gothic Coffers and confirms the long-held theory of their use as book boxes. Many unresolved issues remain, however. Further analysis of the texts of all the prints awaits publication. Most of the short texts, which are all xylographic, include excerpts from prayers and biblical texts. But, their precise sources, how they were chosen and by whom, and how they shaped the devotional experience of the Gothic Coffers needs clarification. Preliminary findings are presented here. The artistic milieu for the production of the prints also merits closer attention. Attribution of the designs for the prints to the Master of the Très Petites Heures of Anne de Bretagne is generally accepted, but scholarship on this artist (variously known also as the Master of the Apocalypse Rose of the Sainte-Chapelle, the Master of the Chasse à la licorne, the Master of the Life of Saint John the Baptist, and perhaps identical with the painter Jean d'Ypres) is complex, and the workings of his atelier unclear. This multi-media artist was responsible for painted altarpieces, stained glass windows, designs for tapestries, illuminated manuscripts (his eponymous Book of Hours is Paris, BnF, NAL 1320 of 1498), and designs for woodcuts. His style, as well as his repertory of models, establishes him as the artistic heir of the Master of Coëtivy, possibly identical with the painter, Colin d'Ypres (active 1450-1485). The documented career of Jean d'Ypres from c. 1490 to 1508 corresponds with that of the Master of the Très Petites Heures of Anne de Bretagne. Yet, the volume and diversity of his artistic production in the international arena of the Parisian art market at the beginning of print culture suggest a flourishing workshop not a lone individual. Further investigation of these practical, accessible, and intriguing objects promises new insights into the relationship between devotional imagery and visual culture in Early Modern France. Avril, François, and Nicole Reynaud. Les manuscrits à peintures en France, 1440-1520. Paris, 1993, pp. 265-270. Boerner - C. G. Boerner, Les Enluminures, and Helmut H. Rumbler Kunsthandlung.Woodcuts in French Late Gothic Coffrets: an exhibition presented on the occasion on the IFPDA Print Fair in New York, 2008. Field, Richard. Fifteenth-Century Woodcuts and Metalcuts from the National Gallery of Art, exhibition catalogue, Washington, D.C., 1965. Hindman, Sandra. "Gothic Traveling Coffers Revisited," in Le Livre, La Photographie, L'Image & La Lettre. Essays in Honor of André Jammes, ed. Sandra Hindman, Isabelle Jammes, Bruno Jammes and Hans P. Kraus Jr, pp. 312-327, Paris, 2015. Huyhn, Michel and Severine Lepape. "De la rencontre d'une image et d'une boite: les coffrets àestampe," La Revue des musées de France, no. 4 (2011), pp. 37-50. Jammes: Coffrets - Pierre Bergé & Associes, Vente Collection Marie-Thérèse et Andre Jammes, Coffrets de Messagers, Images du Moyen Age et Traditions Populaires, Paris, Drouot Richelieu, 7 Novembre 2007. Karr Schmidt, Suzanne and Kimberly Nichols. Altered and Adorned. Using Renaissance Prints in Daily Life, exhibition catalogue, The Art Institute of Chicago in association with Yale University Press, New Haven and London, 2011. Kup, Karl. "A Fifteenth-Century Coffret," Renaissance News 9 (1956), pp. 14-19. Kup, Karl. "Notes on a Fifteenth-Century Cofferet," The Connoisseur 140 (1957), pp. 62-66. Lehrs. Max. "Die decorative Verwendung von Holzschnitten im XV. und XVI. Jahrhundert," Jahrbuch der Königlich Preussichsen Kunstsammlungen, 29 (1908), pp. 183-194. Lemoisne, P.-A. Les xylographies du XIVe et du XVe siècle au cabinet des estampes de la Bibliothèque Nationale, 2 vols., Paris and Brussels, 1927. Lepape, Severine. "Du nationalism au surréalism: une petite histoire de coffrets," Bulletin du bibliophile, no. 1 (2012), pp. 11-23. Lepape, Severine. "When Assemblage Makes Sense: An Example of a Coffret à Estampe," Art in Print, 2, no. 4 (2012). Nettekoven, Ina. Der Meister der Apokalypsenrose der Sainte Chapelle und die Pariser Buchkunst um 1500, Ars Nova, 9, Turnhout, 2004.